There is very little more comforting on a cold rainy day than sitting in front of a fire in a cosy cottage looking out over the countryside drinking a steaming mug of tea and eating a slice of hot toast slathered with melting butter and sticky honey. This week I did find myself on a cold rainy day sitting in front of a fire in a cosy cottage, looking out over a field filled with sheep, rabbits, beehives and birds, drinking a steaming mug of tea. In front of me was a gorgeous jar of golden honey from the bees in the hives but I had no bread to turn into toast. 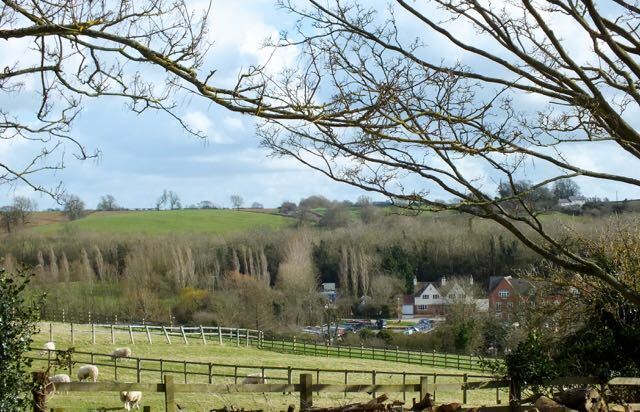 Southfield Cottage, is in the village of Braunston where our narrowboat Patience is moored. Patience is currently undergoing an overdue and much needed lick of paint and so because we were keen to document her change from rust-bucket to sleek shiny narrowboat we decided to spend a couple of days at the start of the painting process in Braunston. Southfield Cottage not only overlooks the picturesque field described above but provides a vantage point from which to survey both the hills in the distance and the marina below. You can in fact see our mooring from the front door of the cottage. 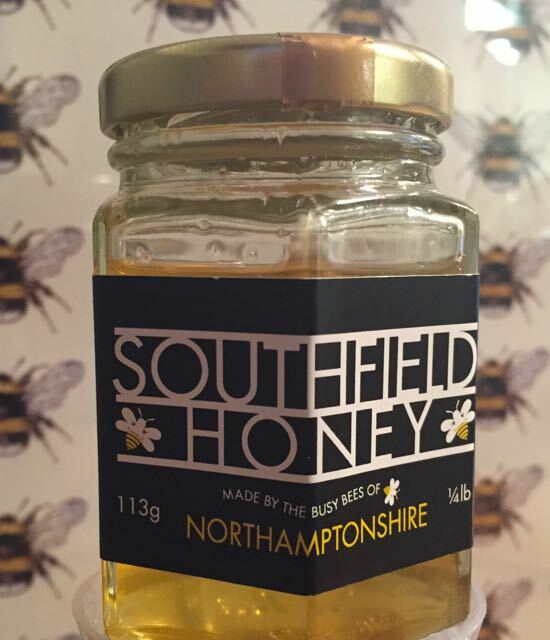 We were thrilled to find Southfield on the internet, even more thrilled when we walked into the cottage and found one of the most beautiful and stylish cottages imaginable and delighted by the jar of Southfield honey we found waiting for us on the kitchen counter. Since I couldn’t indulge in honey on hot buttered toast I set my mind to thinking about what else I could do with it. 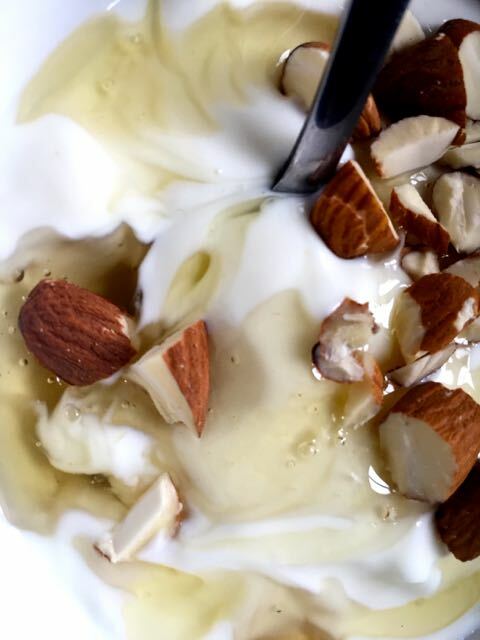 We could of course have it for breakfast with Greek yoghurt and chopped almonds – and we did the next day – but what could I do with it immediately? Supper was coming up and we were planning a sort of a breadless ‘ploughman’s’ supper using bits and pieces in the fridge – cheese, pickled peppers, cucumber, a sausage, green beans and an onion. How could honey fit in with that? It was in fact exactly what I needed to transform the raw onion into something a lot more palatable. And with the addition of herbs growing in an old porcelain basin outside the cottage door I made a pan of slow cooked onions with sage, rosemary, lavender and thyme. A perfect accompaniment to our breadless ploughman’s. And then the next night, sticking with the traditional theme, I made a honey and lemon posset. 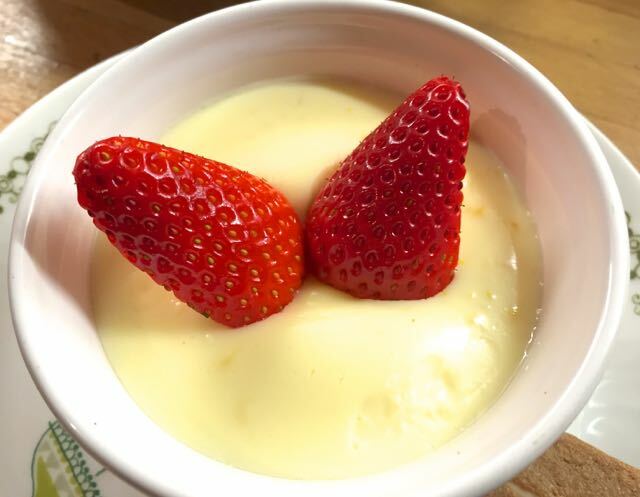 Hugh Fearnley-Whittingstall’s lemon posset recipe is our go-to recipe. This time I adjusted it slightly – see below. Very slowly fry the onions in butter on a low heat until they are soft, adding more butter if necessary. Add the herbs, honey, salt and pepper and continue frying very slowly until golden brown and starting to crisp on the edges. Mix the cream, sugar, honey and lemon zest together. Bring slowly to the boil stirring to dissolve the sugar. Boil for three minutes without stirring. Remove from the heat and mix in the lemon juice. Divide between six ramekins. Refrigerate for a couple of hours. Garnish with a few berries and serve with honey flavored biscuits. you make everything sound so easy, Trish! Mmm, perhaps that’s because I generally go for quick and easy.